The end of the nineteenth and the beginning of the twentieth century was a time characterized by radical changes and great heretics. The secret lore and the occult in general were triumphant, and there were good reasons for this: the triumph of materialist positivism with its Manchester industrialism was beginning to show its first malice, resulting in social and psychological uprooting; the destruction of nature had already begun to bear its first poisonous fruits. In brief, it was a time when it seemed appropriate to question the belief in technology and the omnipotence of the celebrated natural sciences. Particularly intellectuals, artists, and the so-called “Bohemians” became advocates of values critical of civilization in general as can be seen in the literature of Naturalism, in Expressionist Art and in the whole Decadent Movement, which was quite notorious at the time. Austin Osman Spare (1886-1956) was a typical child of this era and, after Aleister Crowley, he was definitely one of the most interesting occultists and practicing magicians of the English-speaking world. Nowadays he is basically known only in this cultural context;  internationally, he has received only some attention in literary circles at best-ironically, in a footnote! This footnote is found in Mario Praz's pioneering but, unfortunately, rather superficial work La carne, la morte e il diavolo nella letteratura romantica (The Romantic Agony, Florence, 1930) where he terms him, together with Aleister Crowley, a “satanic occultist” -and that is all. Nevertheless, this important work has at least led many an occult researcher familiar with literature to Spare. Compared with Aleister Crowley's enigmatic and infamous life, Austin Osman Spare's existence certainly seemed to befit only a footnote. Despite his various publications after the turn of the century, he remained practically unnoticed until the late sixties. He was born in 1886, the son of a London police officer, and we know very little about his childhood. He claimed to have experienced while a child an initiation of sorts by an elderly witch, one Mrs. Paterson who, as far as we know, must have been quite a Wiccan-like character. Spare found his intellectual and creative vocation as an artist and illustrator, and he attended the Royal College of Art, where he soon was celebrated as a forthcoming young artist. But he rebelled against a bourgeois middle-class career in the arts. Disgusted by commercialism, he retreated from the artistic scene soon afterwords, though he still continued editing various magazines for quite a while. From 1927 until his death, he virtually lived as a weird hermit in a London slum, where he sometimes held exhibitions in a local pub. People have compared his life with that of H. P. Lovecraft, and certainly he too was an explorer of the dark levels of the soul. Around the beginning of the First World War, he released some privately published editions, and today one can acquire-at least in Great Britain-numerous, usually highly expensive, reprints of his works. However, we are primarily interested in two volumes, namely his well-known Book of Pleasure (Self-Love): The Psychology of Ecstasy (London, 1913)  and Kenneth Grant's excellently researched book  in which he, as leader of his own brand of O.T.O. (Ordo Templi Orientis) and as an expert on Crowley, deals with the practical aspects of Spare's system as well. Spare's actual philosophy will not be analyzed in depth here because this is not really necessary for the practice of sigil theory and it would lead away form the subject of this study. 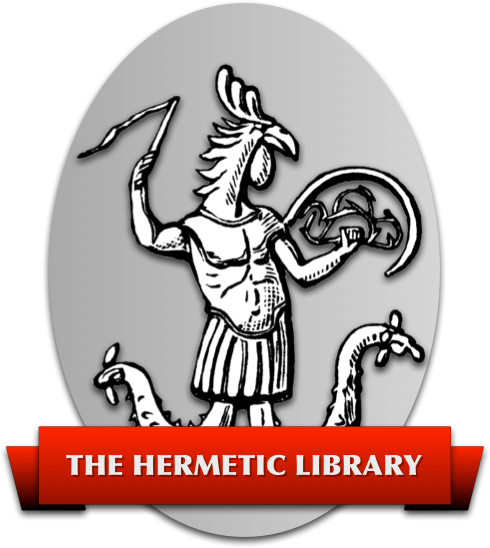 The Hermetic Order of the Golden Dawn also employed sigils as “images of the souls” of magical entities, which enabled the magician to establish contact with them; nevertheless, the technique of their construction was not explained. The same may be said for the O.T.O. under Crowley's leadership and for the Fraternitas Saturni under Gregorius. The name Agrippa already hints at the fact that magical sigils have a long historical tradition, which we will not discuss here because then we would have to cover the whole complex of occult iconology as well. In general, people think of “correct” and “incorrect” sigils. The grimoires of the late Middle Ages were often little else but “magical recipe books” (the frequently criticized Sixth and Seventh Books of Moses basically applies the same procedure of “select ingredients, pour in and stir”), and these practitioners believed in the following principle: to know the “true” name and the “true” sigil of a demon means to have power over it. Pragmatic Magic, which developed in the Anglo- Saxon realms, completely tidied up this concept. Often Crowley's revolt in the Golden Dawn-at first in favor of but soon against Mathers-is seen as the actual beginning of modern magic. It would certainly not be wrong to say that Crowley himself was an important supporter of Pragmatic thought in modern magic. But in the end, the Master Therion preferred to remain within the hierarchical Dogmatic system due to his Aiwass-revelation in Liber Al vel Legis. His key phrase “Do what thou wilt shall be the whole of the Law. Love is the law, love under will,” as well as his whole Thelemic concept, prove him a Dogmatic magician. Not so Austin Osman Spare. He seems to derive from the individual-anarchistic direction so that we may describe his philosophy, without undue exaggeration, as a mixture of Lao-Tse, Wicca and Max Stirner. English magic of the turn of the century was also influenced by an important young science which would actually achieve its major triumphs only after the Second World War-the psychology of Sigmund Freud. Before that, Blavatsky's Isis Unveiled and The Secret Doctrine, as well as Frazer's The Golden Bough, had given important impulses to the occult in general. William James's comparative psychology of religion influenced deeply the intellectuality of this time, but Freud, Adler, and especially Carl G. Jung eventually effected major breakthroughs. From then on, people started to consider the unconscious in earnest. This apparent digression, which had to be kept very short due to lack of space, is in reality a very important basis for the discussion that follows. We will not analyze in depth by whom Spare was influenced. Lao-Tse and Stirner having already been mentioned, we might note numerous others from Swinburne to Crowley himself, in whose order, the A:.A:., Spare had been a member at least for a short while. Rather, we will discuss his greatest achievement-his psychological approach towards magic. In the German-speaking countries, the situation is quite different. Writers like Quintscher, Gregorius, Bardon, Klingsor and even Spiesberger allow but little room to maneuver when creating magical coordinates individually. Here the adept is expected to grow into a ready-made system instead of fashioning one. This is a completely different approach, the value or non-value of which we will not discuss here. The nearest thing to Pragmatic Magic, existing already in 1917 i.e. 1921 (the date of the second revised edition of his major work on magic as an experimental science), was Staudenmaier. The works by Mahamudra, which have of late been receiving some attention, are mainly of a descriptive nature and deal with traditions and new interpretations, thus remaining within the context of German magical heritage; however, they do take heed of recent results in scientific psychology and are, therefore, at least partially related to the Pragmatic approach. Pragmatic Magic will become more and more important because today's magicians have to face a psychologized-and psychologizing-environment whose philosophical relativism has been shaping all of us, and still does. Regardless of the significance or amount of truth one concedes to psychology/psychoanalysis, we all are infiltrated by its way of thinking and its vocabulary. So even we magicians will have to attain to a critical, sensible look at it. It will be left to another era to find different models of explanation, description and practice. How does Spare proceed in practice? Sigils are developed by fusion and stylization of letters (see Figure 1). Thus, the following letters remain: T, H, I, S, M, Y, W, O, B, A, N, E, R, G, F. The sigil is created from these letters; it is permissible to consider one part (for example, M) as a reversed W or, seen from the side, as an E. Hence, these three letters do not have to appear in the sigil three separate times. Of course, there are numerous possibilities of representation and stylization. However, it is important that in the end the sigil is as simple as possible with the various letters recognizable (even with slight difficulty). The artistic quality of the sigil is irrelevant, but for simple psychological reasons it should be obvious that you should not just scribble or doodle in haste. You should strive to make it to the best of your abilities. After spasmodical internalization, the symbol must be destroyed and deleted from the conscious mind. As mentioned before, from now on it will be the unconscious which has to do the work. In my own practical work I have discovered that it may even be useful to keep the sigil on you, such as wearing a ring engraved with it, etc. But this will depend upon the magician's individual predilection, and everybody should find his/her own way. Occasionally, it may prove necessary to repeat the whole procedure, especially if the goal is a very problematical one, requiring an outstanding amount of energy. Nevertheless, experience shows that it is of prime importance not to bring back the meaning and aim of the sigil into consciousness at any time. We are, after all, dealing with a technique akin to autosuggestion; thus, the rules are the same as with autosuggestions themselves. Therefore, you may not use negative formulas such as “THIS MY WISH NOT TO …” because very often the unconscious tends neither to recognize nor understand this “not,” and you might end up getting the opposite result than that which you originally desired. If you see a sigil every day, perhaps on a wall or engraved on the outer side of a ring, this should only take place unconsciously, just as one might not consciously notice an object which is in use all the time. Of course, you should keep your operation secret, for discussing it with skeptics or even good friends may dissolve the sigil's power. The advantages of this method, of which only a short summary can be given here, are obvious. It is temptingly easy, and with only a little practice it may be performed at any time and at any place. It does not call for any costly paraphernalia; protective Circles and Pentagram rituals are not required (though sometimes they may prove useful, especially with operations of magical protection), etc. People who tend to psychic instability should, however, be cautious. Although the threshold to schizophrenia is not as easily crossed with this method as with common evocations, it does involve cutting deeply into the ecology of the psyche, an act which should be considered carefully in any case. The psycho-magical consequences are sometimes quite incalculable. As is well known, the real problem with magic is not so much the question whether it works, but rather the fact that it does. Used with responsibility, this method offers the magician a tool which provides him/her with a limitless variety of possible magical applications.